Fred Haas (’51) is truly a self-made man with a vision — and a proud Cougar. Amiable and unassuming, his name is synonymous with his radio ads: Fred Haas Toyota World! Fred Haas Toyota Country! With one of the top performing car dealerships in the nation, Haas has more than 700 employees, many of whom send their own children to the University of Houston. With nearly 50 years in the business, he has made his mark on the automotive scene in Houston. When asked what brought him such success, he answers: “I’ve worked for myself all my life.” Being entrepreneurial has certainly been a successful path for Haas. As a 22 year old, he owned an appliances business, purchased a second at the age of 27, and sold them both when he was 30. With his savings, he began to buy and sell cars. Since 1978, his dealerships have grown and flourished. 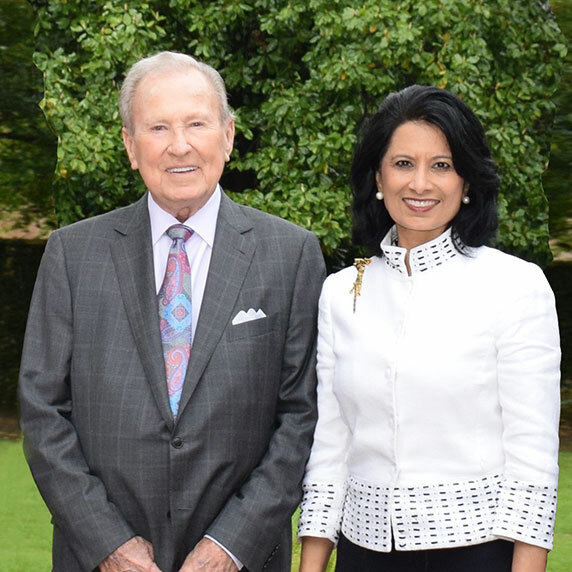 Now his expansive inventory and philanthropic giving are helping to strengthen the University of Houston Athletics Program. A number of student-athletes were able to hear Haas’ story at a recent gathering at President Renu Khator’s residence, the Wortham House. “President Khator is a great leader, and will surely take our University to new heights,” remarks Haas. The students were regaled with stories of the very early days of UH football, and the legendary coaches who helped them achieve greatness. When asked what the University could do even better, Haas pauses. “What you’re doing right now is impressive,” he answers. “Improving, working, moving forward, moving upward — all this is happening right now!” He is especially excited about the $1 billion “Here, We Go” Campaign, and looks forward to what the University will accomplish by 2020. In the meantime, he travels (he has been to 32 countries and has frequented Hawaii for conferences over the years), watches his young grandson play football and attends UH games. Staying active and staying involved has kept Haas in business this long — and promises to be a fountain of youth for this former football star.